What have we learned about how the 2020 Democratic presidential primary might play out based on the 2018 primaries? perry (Perry Bacon Jr., senior writer): Great. What have we learned about the type of candidate Democrats want? perry: To start broadly, what I took from Tuesday (and the primaries more generally this year) is that Democrats are anti-President Trump but not behaving in the anti-party establishment way that the GOP did in 2010, 2014 and 2016. The party establishment candidates (for example, Dianne Feinstein, Robert Menendez, Gavin Newsom) won. Left-leaning voters in California managed to coalesce around Democratic candidates enough to get at least one into the general election in the House districts that Democrats think they can flip (that’s how it looks now, in any case). 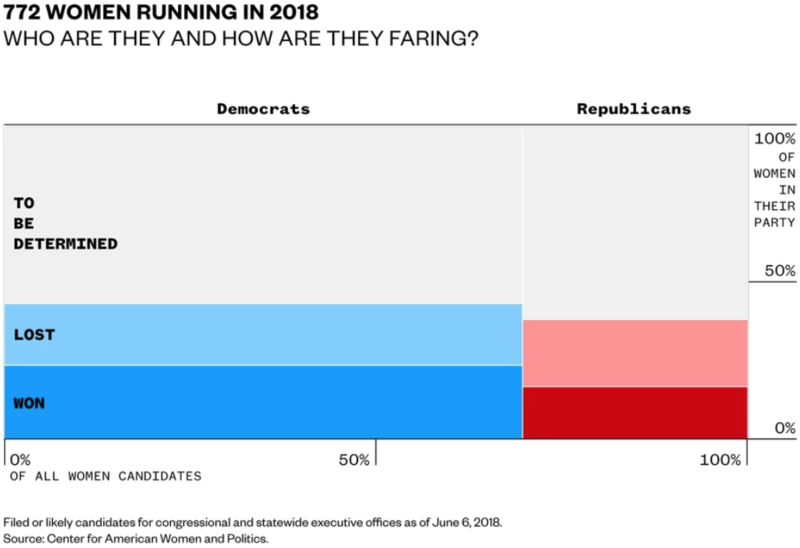 In short, Democratic voters are open to party-backed candidates. julia_azari: Perry is right, though I would also note the many anti-Democratic Congressional Campaign Committee stories that came out of California and other places. It’s less obvious to me that a plurality, much less a majority of Democratic voters, are swayed by their suspicion of the party. But these things can burn slowly. And a vocal minority can really gunk things up for a party, especially if the more establishment parts fail to coordinate. Which is what happened for Republicans in 2016.
perry: Right. Some Democratic activists kind of hate the party. But they still listen to the party. micah: Wait, isn’t that a little strong? perry: Which part do you think is wrong, Micah? micah: Not wrong, but I guess I’m trying to get a sense of degrees. Clearly, there are anti-establishment forces in the Democratic Party. But they’re 40 percent weaker than in the GOP? julia_azari: I don’t think that’s necessarily true. I would argue that in the Democratic Party, those anti-establishment forces are more challenging to combine with a compelling policy/ideological/team-based message than in the GOP. So, anti-establishment sentiment in the Republican Party was easily paired up with anti-Obama feelings (tea party) and anti-immigration feelings (Trump)? What’s the comparison for anti-establishment Dems? Single-payer? Campaign finance reform? micah: Ah, I see. That makes sense. But aren’t they still weaker than in the GOP? The big difference is that de León does not have a Fox News/Breitbart apparatus attacking Feinstein like a Republican would have. julia_azari: Perry, it seems like we somewhat disagree on the big picture of how strong these forces are in the Democratic Party, but the media point is a really critical one. micah: The closest a tea-party-like Democratic challenge has come (and please spare me the emails about how the tea party analogy doesn’t work — I know it’s imperfect) was in Illinois’s 3rd District maybe? perry: Right. And the incumbent in that race was fairly to the right of the Democratic Party. Tuesday’s results are bad for people like Howard Schultz, if the outgoing Starbucks chairman decides that he wants to try to run a campaign to take over the Democratic Party the way Trump did the Republican Party. But, Julia, you think those anti-establishment forces are even weaker than Perry does? perry: I feel like I’m saying they are pretty weak in the first place. micah: Yeah, that’s why I’m confused. Julia thinks they’re stronger maybe? julia_azari: No, I’m saying I think we are in danger of underestimating them based on what’s still a pretty small number of observations. julia_azari: Trump didn’t happen overnight. Not to toot my own horn, but my piece on Trump and Paul Ryan illustrates how these kinds of forces built up over decades in the Republican Party. perry: I think that’s right. I might consider, say, Bernie Sanders, more part of the Democratic Party at this point, in that he does lots of party stuff and the party kind of accepts him. Sanders, even though he is technically an independent, has moved toward the party, and the party has moved toward him. julia_azari: The fact that the DCCC — rather than ideology or policy — has become a point of argument in Democratic circles and in stories about the primaries illustrates the legitimacy problems that parties now face. Who the f even knew what the DCCC was in 2006? perry: So I think Julia and I disagree. It’s a very small sample size. But if I were Joe Biden, I would be happy with how well Feinstein did. And that the party elders did get their candidates in some of these House races. julia_azari: If I were Joe Biden, I would be focused on the credibility of Feinstein’s challenger, so, yeah, we disagree — though I also admit that we’re extrapolating from not much data. perry: Feinstein has moved to the left. She was famously for the death penalty but now is not, for example. But figures in the party, like Obama, were willing to embrace Feinstein even if she is to the right of where the energy of the party is right now. She could have been treated like Bob Bennett or Richard Lugar but was not. julia_azari: Those are good comparisons too. I certainly don’t want to suggest that the situations are identical. But to resonate, anti-establishment Dems need a message that is also about policy and ideas, not just being pissed at the DCCC and the Democratic National Committee. But at the same time, frustration with those institutions is a real phenomenon. micah: OK, so we disagree a little about how establishmenty/anti-establishmenty a candidate Democrats might want in 2020. Let’s talk other candidate characteristics. There’s been a ton of talk about women doing really well. perry: It’s totally different to nominate a female candidate for a House race than to nominate a woman to run for president after Hillary Clinton just lost. micah: Isn’t there research showing that voters are more likely to vote for women for legislative offices than for executive offices? julia_azari: Here is a study that finds that media coverage is more gendered for those offices. julia_azari: People LOVE Pete Buttigieg. perry: In other words, there will be lots more Democratic women running for president in 2020 than in 2016, just because there is no Clinton this time. She screened out lots of male and female candidates. But I’m not sure I take from 2018 that the Democrats are more likely to nominate a woman. julia_azari: It depends somewhat on the way people interpret the 2016 loss. Or you could interpret the dynamics as fundamentally about status quo or not — and see Clinton for the unique figure she is, one who has been in the public eye for decades. perry: But not really the way people interpret the 2016 loss, right? 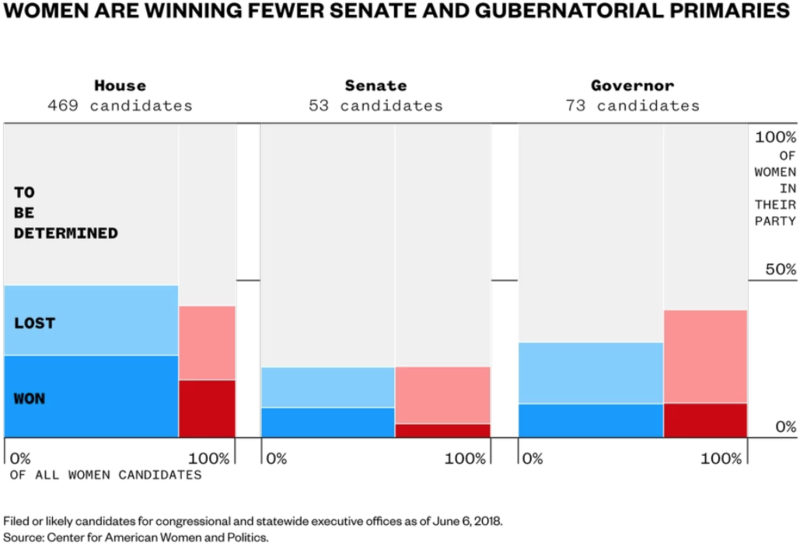 The consultants/donors, etc., have a big influence on who gets to the front of the line in the nomination process, and we know they are more male and white than the party overall. Some of them have concluded that it is about winning Obama-Trump voters. micah: I guess that’s likely right, but won’t there be a hunger for a woman nominee among Democratic primary voters? Isn’t that what we’re seeing in these primaries? perry: We could debate this for a while, but I think Conor Lamb is viewed more as a model for 2020 than Stacey Abrams among the people who matter in the Democratic Party. julia_azari: I mean, not to be blunt, but that’s what we see in society. micah: According to our count, woman have won ~70 percent of Democratic primaries against at least one man with no incumbent on the ballot. julia_azari: There’s a real fever among left-leaning writers, etc., to recommend moving away from identity politics post-2016. I worry that the effect is to put white voters back at the center and neglect groups that have historically, well, been neglected. Still, I think that there will be demand for a woman to run against Trump within the Democratic Party. Let me try to get my thoughts together about women on presidential tickets. micah: Oh what a moment that was. julia_azari: In 1984, Democrats were facing a popular incumbent in Ronald Reagan. And they picked Geraldine Ferraro as the vice-presidential nominee to shake things up and draw attention — which she did. In 2008, Sarah Palin was supposed to, I guess, create conservative excitement for the McCain ticket in a year when Republicans were very likely to do badly. Hillary Clinton inevitability as president was a late-breaking narrative; otherwise, savvy observers had to know that after two terms of a Democratic president and a tepid economy, 2016 was an uphill battle for Democrats. micah: But will 2020 be considered a time of “electoral distress” for Democrats? Won’t it be the opposite? julia_azari: I am getting there, Micah. julia_azari: It’s OK. I meant to warn everyone about the Hamlet-style soliloquy. julia_azari: So 2020. There will be a surface narrative that what’s needed is a woman to take down Trump. But a very cynical reading of this evidence suggests that the most likely scenario for nominating a woman is a sacrificial lamb scenario, in which the party seeks these optics but is really pessimistic about its chances. Trump is an unpopular president, but incumbency is powerful. I hope I’m wrong about this deeply cynical take. micah: Cynicism has a good batting average in U.S. politics. perry: I think the women winning this year are also fairly liberal, so that’s more what I take from these primaries: The party is open to liberal candidates. Abrams in Georgia, for example. In other words, I do not expect a Democratic Leadership Council-style attempt to recenter the party during the 2020 primary. julia_azari: Yeah, that’s a good takeaway. perry: So I imagine it will be hard for the Steve Bullocks of the world (Bullock is the Democratic governor of Montana) — the kind of people who I expect will argue that Democrats are too left. micah: Totally agree. You can imagine a scenario in which the party, as you both said, “moderates” (heavy scare quotes) on identity — white male — but not at all on ideology. julia_azari: Yeah. As I pointed out on Tuesday in the live blog, support for LGBT rights doesn’t make one a radical among Democrats anymore, and the party is fairly uniformly pro-choice, though it means different things to different people. Left of the Affordable Care Act is probably the only way to run on health care. Younger voters are concerned about student debt. micah: Any other candidate traits you’ve noticed before we move to issues/platforms? julia_azari: Yeah. There were signs of that back in the fall — some party-building. perry: I’m having a hard time, based on what I’m seeing now, seeing Democrats uniting around a person who is almost 80 years old. Like, the ideal candidate might be someone who is anti-establishment and left like Sanders but not Sanders — someone who really speaks about #MeToo and Black Lives Matter and Dreamers in an articulate way. Lamb and Abrams are both strong speakers, fairly young, dynamic people. Any thoughts about the platform that the 2020 Democratic primary will be fought over? We’ve gotten into it a little already. perry: I don’t think the Democrats have a big divide on economic issues. The whole party is moving left, and the fight will be over, say, single-payer versus a huge expansion of Medicaid and Medicare. And voters won’t know the difference. julia_azari: Yeah, there’s likely to be some tortured language in the platform about single-payer. perry: Most of these primaries have shown little in the way of policy differences. julia_azari: I expect lots of symbolic agreement on diversity and immigration and upward mobility. The differences to be worked out in governing won’t be easy, but uniting under an electoral banner probably will be pretty straightforward. perry: I do think there is a divide not on positions but on emphasis around, say, gun control, policing, abortion, immigration. Some of the Democratic candidates in these primaries have not been as loud and proudly liberal on these issues. I don’t think, say, Biden will say he is pro-life, but will he defend and back Planned Parenthood as strongly as Kirsten Gillibrand might? There is a core tension among Democrats over identity policy (how liberal to be on these issues) and identity in terms of the electoral coalition (is the goal to win more women, minorities, people who stayed home in 2016 or to win more Obama-Trump voters, who are mostly white). That is a tension they are desperate to smooth over. And can’t. micah: Do you all this Medicare-for-all will be a rallying cry or a litmus test? perry : Medicare-for-all will be a litmus test for the most left candidates (so, say, Elizabeth Warren, Harris, Sanders), but I think Biden can avoid that and be fine. micah: Like, to your point, Perry, I wonder if Democrats will focus on health care over, say, immigration because it plays across those divides (women/non-white voters vs. Obama-Trump voters). perry: In the primary, they will all have the same position on health care, so I suspect there will be some incentive to be left on immigration or some other issue as a way to differentiate yourself. Remember that Clinton sharply attacked Sanders in 2016 from the left over gun policy. julia_azari: I’m honestly not sure how these things will play out. The Democrats tend to have a bunch of issues that are broadly popular but have very concentrated opposition — gay rights, gun control. If the “win back Trump voters” sentiment is strong, who knows what priorities will be emphasized? perry: And I can see that answer not lasting for 24 months (the 2020 campaign cycle). julia_azari: I wrote a response, but it’s a little academic. One question I posed in that piece is how the fights between the parties will affect the fights within them. Historically, they’ve mirrored very closely. But now that the parties are pretty uniform in their basic ideologies, I think that might change. julia_azari: I think the Democratic Party is in the fairly early stages of a pretty big transition — from a patchwork group-based party to a more clearly ideological one. This means there are a lot of directions it could go in 2020, and it’s not clear to me how the power dynamics will work in determining who gets to shape that direction. perry: It’s easy for a party to unite in a midterm against the other party’s incumbent president. The trouble is figuring out the rest: 2018 is just so different from 2020. I left 2014 having watched the Republicans finally figure out how to control their nomination processes and avoid having too many people who couldn’t win the general on their tickets. Then, they nominated Trump. Democrats have figured out a populist message that works for a more diverse slate of candidates. But I don’t know if that will survive 20 candidates in 2019 and 2020 presidential debates — with the press and Trump trying to hype up their fissures.